BREAKING! New Yamaha YXZ drawings released in Yamaha patent! 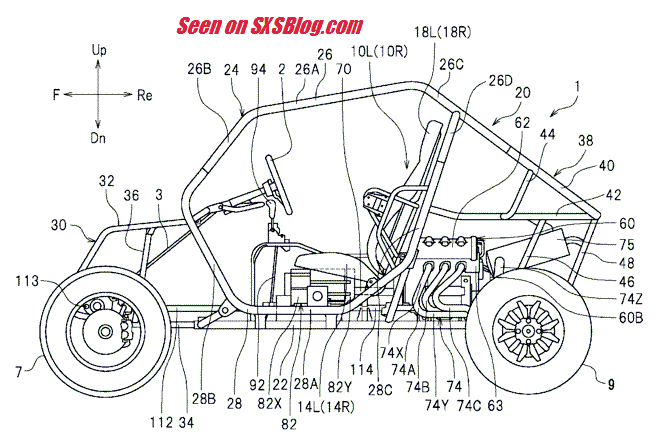 New information exclusive to SXSBlog.com about the 2016 Yamaha YXZ from a recent Yamaha patent filing. This drawing appears to show a 5 speed MANUAL SHIFTER (!!!!) along with the longitudinally mounted 3 cylinder engine with a divorced 5 speed manual transmission. These two drawings show the layout of the interior with regards to the engine and transmission. Most notable here is the presence of the manual shifter and layout of the divorced transmission. Shown here is the intricacies of the engine and divorced transmission layout. “Fig. 6” appears to show a single wet clutch, which may indicate that the YXZ is indeed a 5 speed MANUAL CLUTCHED machine. And lastly there is a basic internal overview of the 5 speed transmission. Below is the technical data from the patent. If any lawyers are reading, feel free to decipher this info for us in the comment section! Feel free to check back with us for the LATEST information on the SXS world! 9 Comments on "BREAKING! New Yamaha YXZ drawings released in Yamaha patent!" It looks like this is what we’ve all been waiting for! Cannot wait for this to come out and see how it changes the UTV market. Looks like this is what we’ve all been waiting for! Cannot wait for this to come out and see how it changes the UTV market. The detail description says that it can be manually shifted or automatically shifted with no input from the driver or both, so they have the bases covered. It also says the clutch could be a wet multi plate or a single dry plate so they covered that too. Drivetrain info was released by CARB earlier this week. 998 cc, 112 hp, 5 speed manual. Ricochet Off-Road will have skid plates in Aluminum and UHMW. Of course with more options than anybody else including anodized colors and custom laser cuts too! Was so excited about this new vehicle I had to create a forum for it! Cannot wait..